It’s been argued that all “good” writers are inherent masters of grammar and spelling. Well, this writer is here to tell you it just ain’t so. Some of us appreciate having a little extra help. For me, that help comes in the form of a handy bit of software called Grammarly. Often times the most crucial part of the writing process is getting the words on to the page (or screen in this case.) When inspiration strikes, grammar be damned. Of course, I have to come back at a later time to start the somewhat tedious process of proofing and editing. My first drafts can be a holy mess of typos, grammar snafus, and overall, jumbles of messy writing. I simply import my work into the Grammarly app and boom! My piece went from “mess” to “masterpiece” in just a few seconds. So what is Grammarly, anyway? At first glance, Grammarly looks like any other spelling and grammar checking tool. The truth is, Grammarly goes far beyond any basic tool and has more than surpassed my expectations. Depending on the subscription you opt for (free version versus the premium option), Grammarly can become a virtual editor and even a personal grammar tutor. At the free level, Grammarly checks for critical grammar and spelling errors. While it seems pretty cut and dry, I’ve found their free version to be one of the best on the market. In fact, I was so happy with the free version that I felt compelled to try the premium subscription, which this deep dive will primarily focus on. With the premium subscription, the features really start to roll in. 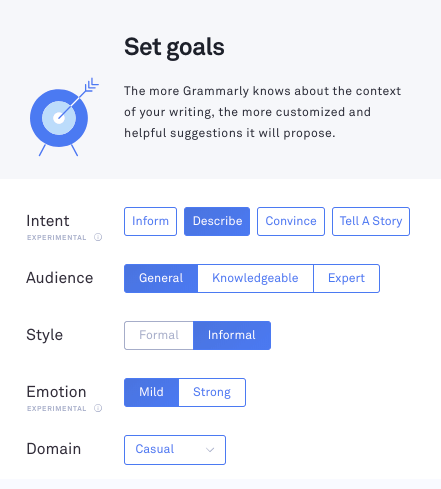 On top of critical spelling and grammar checks, Grammarly takes a considerable step further with more advanced analyses that help take the guesswork out of the proofing process all the while helping to expand your knowledge. Grammarly currently offers three ways to upgrade your account, each coming in at a different price point. Note: Both the quarterly and annual plans are billed as a single payment. 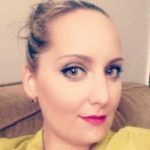 Especially for new freelancers, shelling out your hard-earned cash for an app may seem like a stretch, but I’ve found that it practically paid for itself in no time. After all, you’re getting so much more than just a spell checking app. After testing out the upgraded option for a bit, a few of the features in particular really stood out and helped me feel confident in subscribing. For each document you work on, Grammarly offers some useful information to help you craft the piece you want. The insight tool quickly shows you the number of characters, words, and sentences in your piece. It also provides you with approximate reading and speaking times, which can be helpful in making sure you keep your work within desired limits. 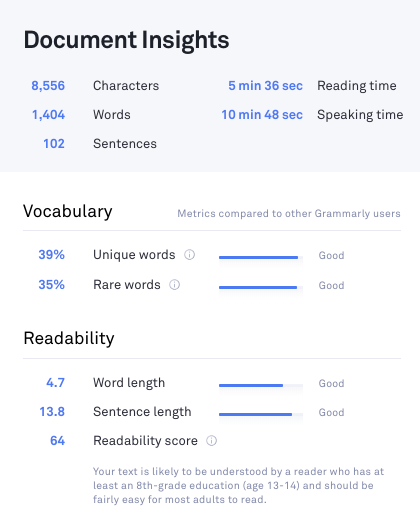 Since grammar and vocabulary is the name of their game, it also provides you with percentages for unique or rare words, average word, and sentence length, as well as your readability score. Your readability score is based on the Flesch Reading Ease Test. The higher your score is, the easier your piece is to read. I found having these insights so readily accessible helps me accurately gauge my progress while making sure my work fits with my target audience. While one of the newer features to the Grammarly premium account, it’s one that best refines the programming to meet your individualized needs. By letting Grammarly know what you’re working on, the software better understands your writing and makes suggestions based on context, rather than grammar and spelling rules alone. You can also update these goals at any time, so you can always adjust as you go along. Grammarly’s weekly progress report epitomizes that adage to a T, making this feature a real standout to me. Each week you’ll receive an email containing a generated report based on your Grammarly use. 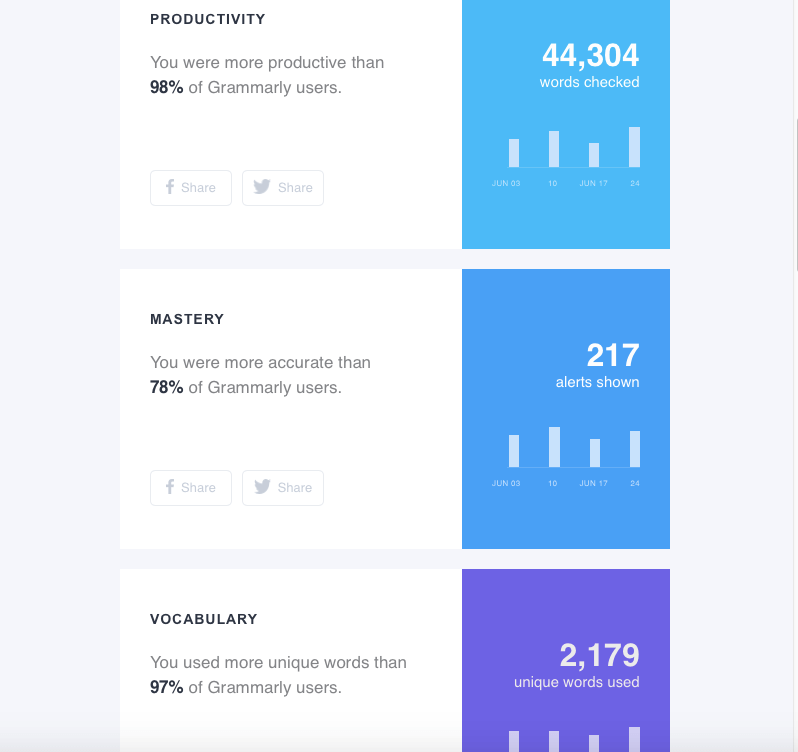 The report focuses on your productivity (number of words checked), mastery (accuracy percentage) and vocabulary (number of unique words used). I enjoy these reports because, being a competitive person myself, I like to see if I can beat my previous week’s record. For those who like a little more validation, your weekly insight report may contain ” achievements” which are badges for writing streaks. The report also lists out your top three grammar mistakes as well as your spelling adversaries (words you commonly misspell). This can be an especially useful tool in helping you improve your writing skills. You’re also provided with a section of tips, tricks, and articles to help you learn a bit more about grammar, ranging from how-tos and trends to lifestyle reads. Lastly, there’s a toggle feature which shows “where you’re protected,” which allows you to see and control which extensions, plugins, and devices are connected to Grammarly. For those who are not yet ready to fully trust their most prized works-in-progress to a computer algorithm, Grammarly offers access to a human proofreader. For .02/word, you can send your work to a real person who will proof your piece. The turnaround time is listed as between 3 and 24 hours. Grammarly also does more than just aid you in your quest for error-free work; it actually can help you learn to be a better writer. Instead of merely correcting mistakes, it offers explanations for the corrections, helping you learn the ins and outs of grammar. Whether you’ve decided on the free or premium version, getting started with Grammarly is a breeze. You can always log in to the Grammarly website, where your projects are autosaved, and you can write and edit directly within the page. However, one of the most powerful selling points for the program is that you can use Grammarly across many platforms with ease. You can sync across up to five devices, making taking your work on the go, more accessible than ever. As with everything, Grammarly does come with restrictions. However rarely, the software can make somewhat wacky suggestions. I’ve noticed that if your writing is a bit flowy, it may suggest changes that may not make sense or otherwise change the meaning of a sentence. In cases like this, I just ignore the suggestion. The software also may not take stylistic choices into account. The addition of the “goal setting” option has helped a bit but, in the end, software can’t be the end-all-be-all for proofing and editing. There is a limit on how much work Grammarly can check, although it seems unlikely you’ll hit that threshold. In a 24-hour period, you’re allowed to check up to 100 documents. The site also states you can check up to 60 pages, per document, at a time. At the end of the day, there really is no replacement for the human eye. While Grammarly can be a huge help, you’ll still need to proofread to achieve flawless work fully. Whether you stumble over sentence structures or you fancy yourself a technically-gifted writer, Grammarly presents a plethora of benefits. 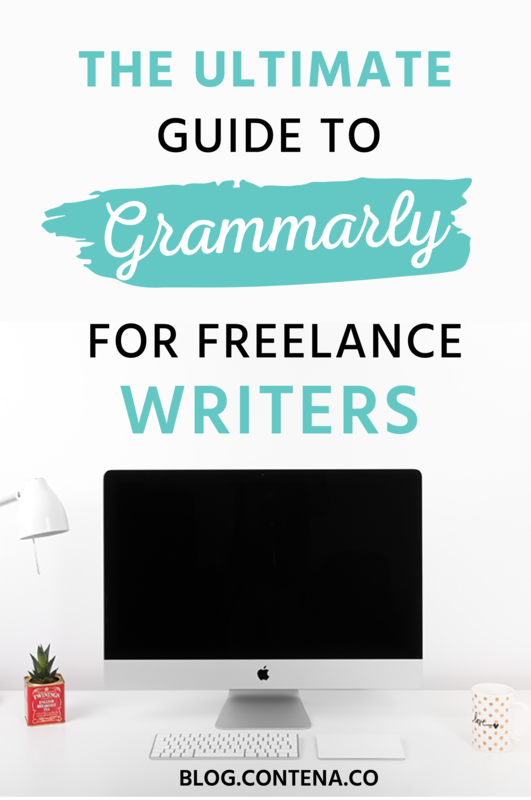 Even the most skilled writers can benefit from the many features Grammarly offers.